Shadow Blade is now available on both platforms. You can find it in the App Store for $0.99 and free on Google Play (although it comes with a$2 in-app purchase of to unlock all the levels). It is a 2D arcade action platform. Although there are many options in this genre, Shadow Blade deserves a special mention thanks to its good balance of fun and game control. 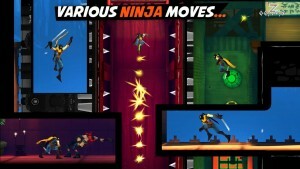 In this game we can control a ninja who is trying to get information for the leader of his clan. To get it, we will need to deal with all the dangers that we will find through each of the multiple levels available. The graphics are very detailed, the scenarios are varied and the background scenes change with each world. The game consists of 42 levels divided into 4 chapters with progressive difficulty. While the first two are pretty easy, the difficulty increases considerably in the next ones, where the number of traps and armed enemies skyrocket. The movements we can do with our character are somewhat limited, but they are enough to ensure a good fun time. We will need to do all kinds of jumps to overcome the obstacles we encounter and attack enemies with the sword to try to cut them in half. In addition, we can attempt more subtle evasion tactics to escape from some situations and avoid that the enemies see us. Shadow Blade has a good rhythm in general, and the action is dynamic and fluid. The control works great whether you choose the gesture controls or virtual ones on the touch-screen. Probably it isn’t going to stand out for its originality, but Shadow Blade is a very good choice if you like the arcade platform genre, and it will assure you a few hours of fun for a very affordable price.